Operating Era: 1894-1929. H. J. Heinz Co., Heinz Refrigerated Pickle Line. 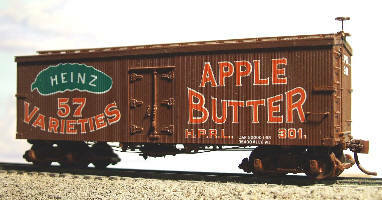 Heinz is famous for billboard reefers, some of the most colorful in history. First leased from Armour in 1894, the white/green scheme was used throughout the 1890`s. About 1900 the oxide car color came in and within 2 years the left side of the car side was standardized while the right advertised various products. In 1907 the car side color was changed to yellow and remained so throughout the `teens. The cars were upgraded to meet the Safety Appliances Act of 1911 and strengthened with steel bands. 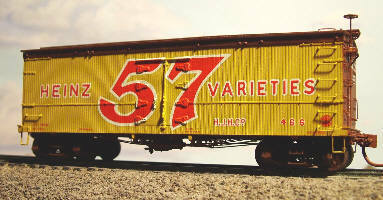 A large "57" was placed on all cars, ending the era of the variable billboard. In the 1920`s car color was returned to oxide but the logo remained the same. Some of these Kits are unavailalbe as we are working on new decals for them. Please check back for rereleased Kits. PLEASE SEE OUR REFRIGERATOR CAR SECTION FOR OTHER REEFER KITS. PLEASE SEE OUR #2200 SERIES KITS FOR OTHER PICKLE CARS. Now comes with new One-Piece Roof Frame.